After making headlines for divorcing just 72 days after saying "I do," reports of whether Kim Kardashian's marriage was all a hoax is plaguing the curvaceous star -- who is currently in Australia promoting handbags. According to People, a source close to Kim defends the authenticity of her relationship with Kris Humphries, saying, "She's a hopeless romantic and she felt like she got her fairytale when she turned 30." 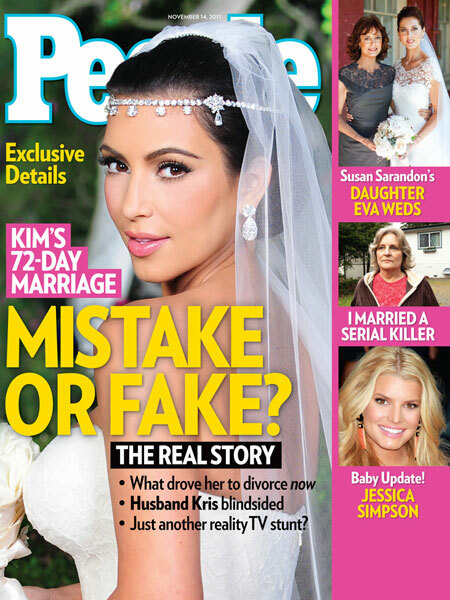 The insider also said that a month after the lavish Montecito ceremony, "[Kim] knew she had made the wrong decision." Another source close to Kim said, "Throughout their whole engagement they were so excited for what was to come and their life together. But once they slowed down and settled into 'real life,' it became apparent that this wasn't what they both thought it was." The insider added that Kim "is embarrassed about the entire thing." Kardashian, 31, began dating Humphries, 26, a year ago. On Monday, she filed for divorce.